Michael was eager to check out the latest skinny ties at Merry-Go-Round. Don was after a blacklight poster and possibly a naughty gift from Spencers. Chad just wanted to see if the new Devo album had hit the Record Bar yet. Alas they are no more. Only the mighty food court survives, and, just like us, it has grown up . . . and expanded. The mall food court is reborn in Morgan Street Food Hall, an evolution of the food truck and gourmet pop-up restaurant movement where grownups (or those of us pretending to be) can sample a wide variety of interesting and innovative cuisines. Morgan Street’s owners call it a “lifestyle dining concept.” Whoever wrote that pretentious twaddle needs to be beaten with a soft pretzel. No, there is no Orange Julius or Cinnabon, and there’s not an Sbarro anywhere in sight, but you and your friends can still mix and match — get a slice of pizza, a swanky taco, an empanada, sweet baked goods and a local beer. And there is definitely a burger available, a pretty darn good one, as it turns out. Chad’s Review: Cow Bar’s standard offering consists of two four-ounce patties, cooked medium, on a toasted bun. They also offer a quad with four patties if you’re so inclined. I went with the Southern Classic, a standard burger with chili, cheese, slaw & mustard. The first bite was spectacular, beefy with a great crusty char. I was seriously impressed. 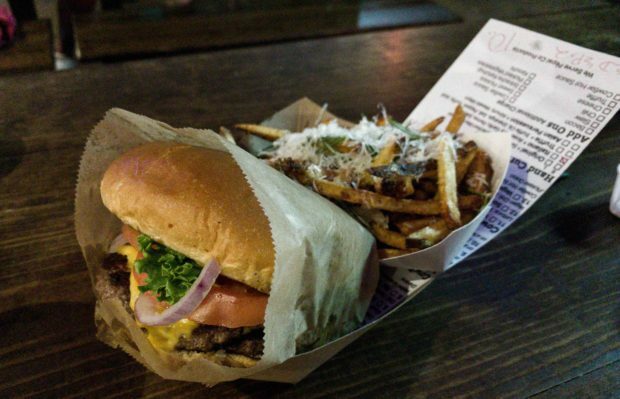 But an experienced burger maven knows not to be wowed by that first kiss of flavor. With a burger like this, the chili and slaw should either complement the burger or contrast with it. Tart, crunchy slaw should offer a counterpoint to the savory richness of the burger. The chili should offer another flavor note, an accent distinct from the burger but adding to the overall impression. In this case the chili wasn’t quite up to the task. Rather than accenting the burger’s flavor, it masked it, diminishing the combination. 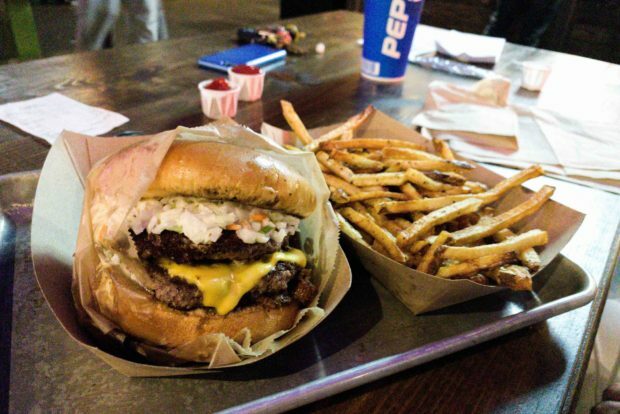 The slaw was crisp but ended up making the burger more wet than flavorful. I gave up trying to eat the burger out of hand after a dozen or two napkins and just attacked it with a knife and fork. The chili needs a more intense flavor and possibly a little heat to really bring the burger to life. And if I were making this burger I would use a red slaw (like the slaw from Stamey’s barbecue in Greensboro & Lexington) for a little more pop. Don’t get me wrong, this was a damn fine burger. I give it a very respectable 4.0 on the Straight Beef’s five-point scale. Don’s Review: Sliding on my parachute pants, baggy Frankie says “Relax” t-shirt, and checkerboard vans, I was excited to meet the guys at the food court. You can imagine my surprise when I got there and the stores were gone and I was the only one in the latest fashions. Michael’s Review: When you need a break from trying on Capezios, channel Buster Poindexter and order the Atomic Nuclear Burger. Man. This was the hottest thing I have eaten in a long time. I’m not too proud to admit that I had to take off half of the jalapeños to make it more edible for me. Don’t take that as a dig on the flavor. It was a tasty burger. Two thin patties that weren’t overdone. It could have used a lot more cheese to cut some of the spice and give the whole experience a little more texture, though. I fell prey to another stunt burger and bit off a little more heat than I could handle. 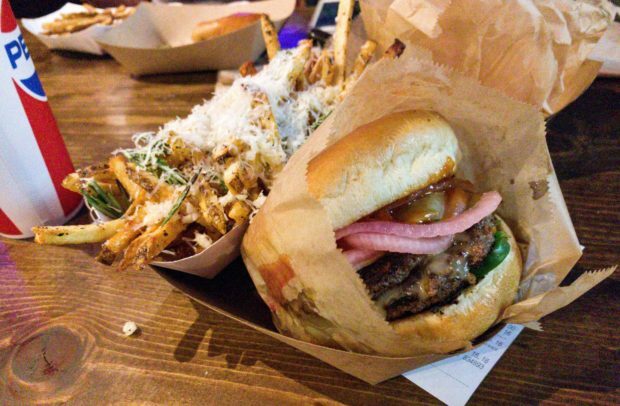 There was so much capsaicin on this burger, umami was beaten into submission and set ablaze. Olé olé olé olé. 4 olés is about right. A solid burger. Just a little too Hot Hot Hot for this hombré.